The Internet has become an essential utility over the last two decades. Not only for consumers but for the businesses that provide their goods and services. It has become essential for websites to appear at the top of search results, but unfortunately many websites today are designed solely with looks in mind. Little regard is given to ensuring newly designed websites adhere to the web standards that contribute towards a good position in search engines. There is a need to shake up the industry by promoting good web standards. To this aim we are delighted to celebrate Yachting Limited's twentieth birthday by launching YachtRank. 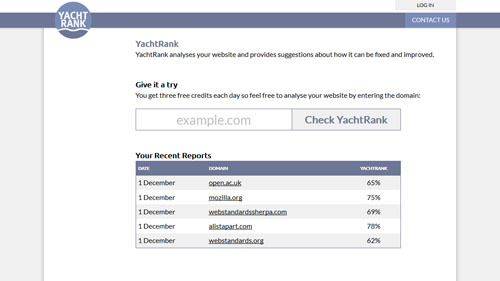 YachtRank is a free tool that analyses the websites of yacht companies and lets you know how well the sites perform. At launch YachtRank performs thirty separate tests on each website. As well as providing an overall score for your site so that you can compare it with similar sites the report provides a pass or fail result for each test so that we can focus on the areas that require attention. Throughout 2018 we will be adding many more tests with the aim of providing more than fifty tests for your site. We will be highlighting the importance of a different standard every month. Don't wait until January for the first featured standard though. Pop over to YachtRank and see how your website can be improved.